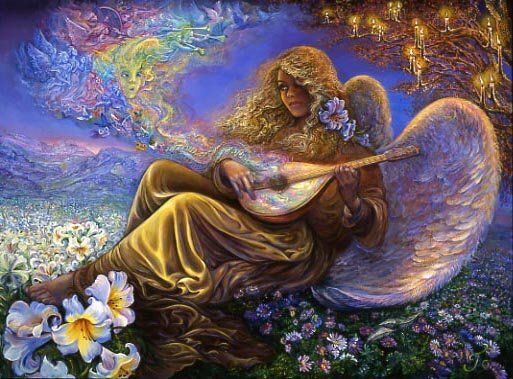 Beneath the warm glow of her magic candle tree, and surrounded by the sweet perfume of a carpet of flowers, an angel lovingly strums her enchanted instrument, A host of melodies quite different from each other blend into a pleasing harmony drifting into the fading light. The heavenly sounds will encompass the earth, and thus she hopes to demonstrate how people, although quite different in colour and beliefs, can also blend in peace and harmony, through the universal language of music. As everyone that has been to my website knows...I'm a Josephine Wall Art fan...so I thought I'd post one of her newest paintings along with the story she writes up to go along with it...and encourage the readers of my blog to go and check out her website...it's definitely a soulful experience! You'll be sure to love it...just like I do!